nurturing. Read on to learn more. "Babies exposed to narcotics while their mothers are pregnant experience vomiting, diarrhea, shaking and even seizures after birth, and they cry inconsolably as a result. 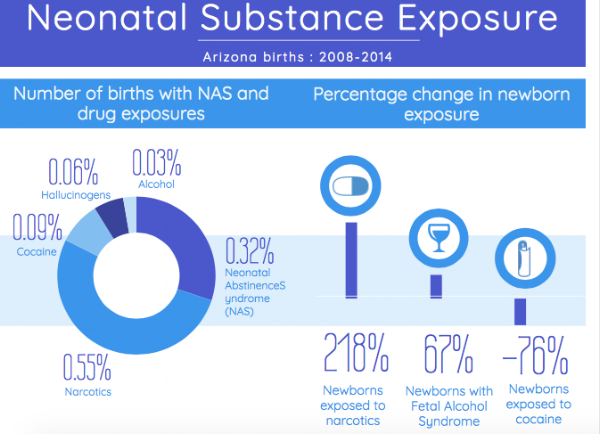 These are the side effects of neonatal abstinence syndrome or NAS — the clinical term for an infant withdrawing from narcotic substances — which has increased by 235% from 2008 to 2014, and 27% since 2013, according to the Arizona Department of Health Services." As more pregnant women use heroin, meth, other drugs, more babies suffer the consequences. "In Arizona, the rate of Neonatal Abstinence Syndrome has increased more than 218 percent between 2008 and 2014, according to the Arizona Department of Health Services. (Photo by Johanna Huckeba/Cronkite News)"
• Hospital NICU's are equipped to deal with severe medical issues and not drug exposed babies.